Frozen goodness and elbow grease. Stand at the edge of grimy, crowded little Fruitvale Plaza Park at International and 35th and look down: The pavement is a polka-dot schematic of gum stains, turned black as smashed raisins from the grinding of restless sneakers and stroller wheels, grandma grocery baskets, and the stiff, pointy cowboy boots guys don on Sundays. In the teeming heart of Fruitvale, the sidewalks are just about paved with the ghosts of sweets past. What is it about sweetness that gets to the heart of this neighborhood? From the densely packed dulcerias  sweet shops  where kids pick the candies to fill birthday piñatas, like the dangerously spiky one a small girl is carrying out onto the sidewalk, trailing pink crepe streamers. It's like some medieval stabby weapon in drag, plastered with the crinkly Mylar likeness of Sleeping Beauty and just itching to be packed with peanut mazapans and tart tamarind Pulparindos. True, Fruitvale is one of the few Oakland neighborhoods truly teeming with kids, a fact that guarantees baseline success for its vendors of sugar shock. But it goes deeper than that, way down to something essential about the neighborhood and its sticky residue of Jalisco culture. From pan dulces in the bakeries to the shaved ices called raspados doused in sticky vanilla sauce and the nieves  ice creams  sweetness can seem like the edible equivalent of the shiny-gown glam on display in the quinceañera shops. A touch of glamour, triple-dipped in instant gratification. But probe beyond the dulcerias, and you find sweets with more mature appeal, often with the kind of swelter-quashing qualities that make them perfect for the dog days, poised to trot in any day now. When it comes, sweat all the way to Nieves Cinco de Mayo. No relation to Nieveria Cinco de Mayo on International near High Street, this is a tiny ice cream stall in the Fruitvale Transit Village's not-yet-fully-open Public Market. It's the kind of place that should make the proprietors of chi-chi ice cream shops think about unplugging their fancy Italian machines and retiring to become yoga instructors or something. 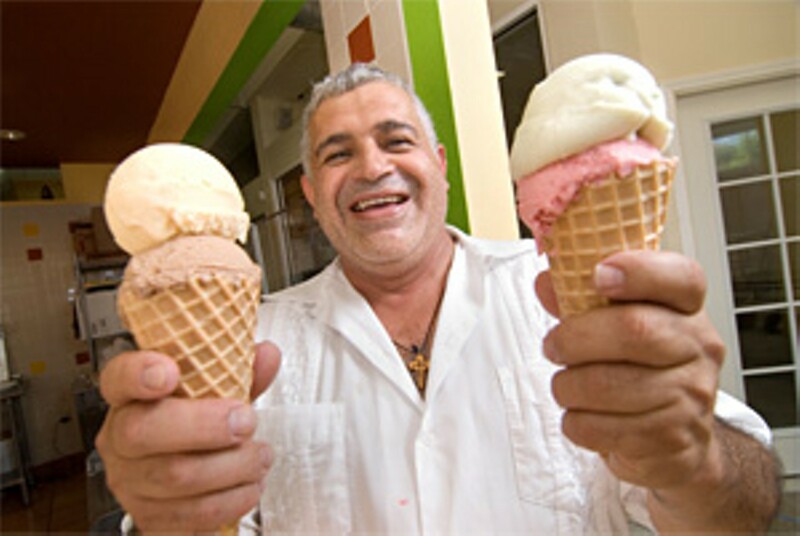 No doubt ice cream maker Luis Abundis could get along fine without a working current, much less high-end machinery. Six days a week, his stall has up to ten flavors on display  all churned by hand. Let that sink in: entirely handmade ice cream, frozen in a contraption that amounts to little more than a metal bucket and elbow grease. A big man with a ruddy face, Abundis calls his creations nieves artisanales de garrafa  artisanal carafe ice creams. The technology dates back to the time Europeans were fighting each other with pikestaffs. It consists of an open-mouthed canister (the carafe part), a mixture of ice and salt, and a boatload of endurance. That's it. Abundis' old-school rig doesn't even have the benefit of a rotating paddle, a feature of Little-House-on-the-Prairie-era hand churns that kept the congealing slurry in constant motion so ice crystals couldn't form. Instead, the husky nieviero jiggles and shakes his garrafa up and down in its ice-filled wood-slat bucket, folding the frozen mix back into the still-liquid mass with a paddle that looks like an overgrown soup spoon. A single batch can take up to an hour. Multiply that by ten flavors, and the result is a seriously awe-inspiring commitment to the craft of frozen goodness. It leaves you doubly amazed to consider that each good-size scoop costs only a buck. Clearly, nobody goes into the hand-churned ice cream business to get stinking rich. Not Abundis, not his small, smiling mother Lupe, who staffs the counter until she senses you don't speak Spanish and then yells for Luis. Just taste what your dollar buys. Naturally, Abundis mixes up his flavors from scratch using milk instead of heavy cream, just as Italian gelato makers do. During a few recent visits, the ice cream maker's elote  corn ice cream  was nothing short of fantastic. Gelatolike without the puddingy texture and concentrated taste it implies, refreshing rather than rich, a smoothness formed of myriad fragmentary ice crystals. The flavor? A distillation of vegetable starch and sweetness, like your fondest memory of canned cream-style corn. But Abundis uses fresh corn. The depth of maize-y sweetness makes me suspect he steeps sheared kernels and scraped cobs together in milk before straining (imperfectly  you sense the odd fragment of corn silk) and freezing. Other flavors are more recognizable to anyone raised with half-gallon blocks of supermarket Neapolitan. It's the other flavors that evoke the neighborhood. Rompompe, named for Mexico's eggnoggy rum punch: pale orange and studded with fat, soaked raisins. A bit extract-heavy, maybe. It's no match for mint, yerba buena, delicately green, and, well, minty. Pale brown ciruela  prune  is broadly sweet and faintly tannic, the way the insides of cigarettes smell. Farther down International Boulevard, perpetually sticky Cafe El Oasis seems to generate its own heat. With a ceiling that seems to beetle just above your head and a spiral mosaic floor that looks like an Aztec calendar of orange chiclés turned grimy in patches, the air feels perpetually humid. You can get just about any snack you desire, including tripe (a homemade sign advertises menudo in letters whose size suggest a certain desperation to move it). But the soul of the place is fruit  tropical ones, like mamey, guava, and pink papaya  hacked up and heaped into bionicos, the fruit salads drenched in Mexican crema, too rich to rate either healthy or refreshing. Fortunately, El Oasis' take on escamocha is both. What's escamocha? Think fruit salad, drenched in strawberry sauce that's nothing more than the clear liquid that seeps from heavily sugared strawberries. The fruit salad itself skews exotic: firm mango, pineapple with a backbone of fiber where the core still clings, squashy cubes of delicately sulfurous papaya, all mixed up with more prosaic elements such as hunks of skin-on Fuji apples and bits of strawberry. But the sauce unites everything in a babydoll-pink stain, not to mention an intense strawberry perfume that seems to generate its own humid breath. Simple, but the effect is hyperlush. The shaved snow-cone ice in El Oasis' raspados is more manufactured than shaved, really, molded in the ice machine. Still, the frozen shards feel satisfyingly blunt and nubbly, the way a mouthful of shattered car windshield might  if shattered windshield were a good thing to roll around your mouth, that is. Until it starts to mingle with the melting ice, the Jamaica syrup made from hibiscus flowers is viscous and intensely sugary. The kind of thing that, for a moment anyway, seems to distill the flowery essence of the neighborhood outside.